Henize 2-10 is a dwarf galaxy, and it is the first dwarf galaxy ever discovered to contain a supermassive black hole at its center. This was surprising because the black hole is about one quarter of the size of the one at the center of the Milky Way Galaxy. However, Henize 2-10 is only about1/1,000th the size of the Milky Way.. 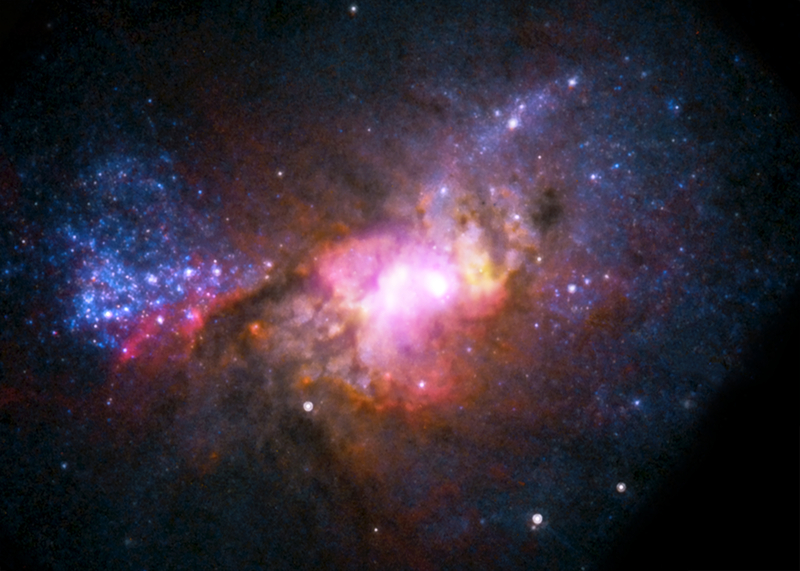 This image combines x-ray (Chandra), visible light (Hubble), and radio telescope (Very Large Array) views. UGC 4459’s diffused and disorganized appearance is characteristic of an irregular dwarf galaxy. Because they lack distinctive structure or shape, irregular dwarf galaxies are typically chaotic in appearance, with neither a nuclear bulge (a tightly-packed central group of stars) nor any trace of spiral arms extending from the center of the galaxy. UGC 5340 is a nearby dwarf galaxy that is a bit of a puzzlement. It seems to be much younger that the Milky Way and the other galaxies in our local group. We don’t know for sure if that true or, if it is, why. UGC 4879 is an irregular dwarf galaxy. It is very isolated, which means that it has not interacted with any surrounding galaxies, making it an ideal laboratory for studying star formation uncomplicated such interactions. Studies of UGC 4879 have revealed a significant amount of star formation in the first 4-billion-years after the Big Bang, followed by a strange nine-billion-year lull in star formation which ended about 1-billion-years ago. That behavior is puzzling, and the solitary galaxy continues to provide ample study material for astronomers looking to understand the complex mysteries of starbirth throughout the Universe. 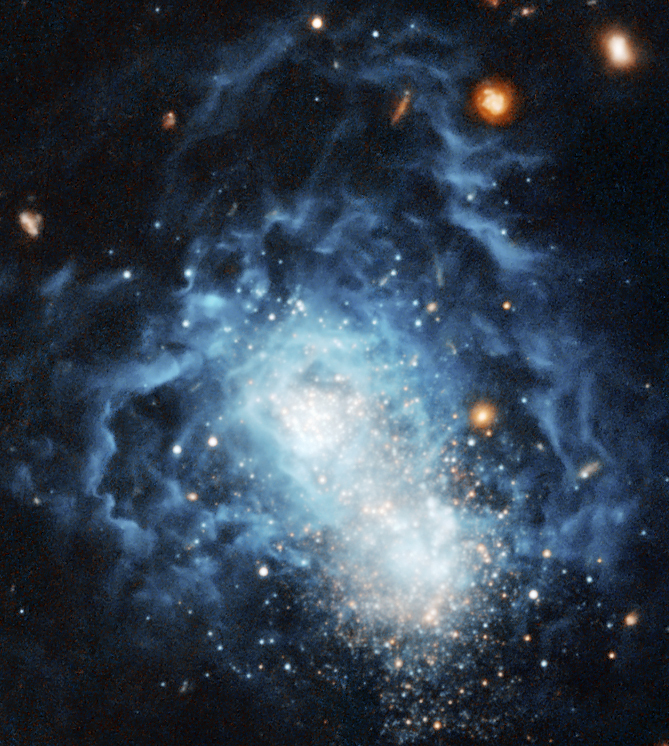 I Zwicky 18 is a dwarf irregular galaxy located about 59 million light years away. Spectroscopic observations with ground-based telescopes showed that I Zwicky 18 to be almost completely made up of hydrogen and helium, the main ingredients created in the Big Bang, and galaxies with I Zwicky 18’s youthful appearance are typically found only in the early universe. Initial observations with the Hubble Space Telescope suggested an age of 500 million years, but later Hubble observations found faint, older stars in the galaxy, suggesting its star formation started at least one billion years ago and possibly as much as ten billion years ago. It’s possible that the galaxy may have formed around the same time as most other galaxies. IC 4710 lies roughly 25 million light-years away in the southern constellation of Pavo (the Peacock). It’s an irregular dwarf galaxy, a chaotic cloud of bright stars, with bright pockets of new star formation scattered around its edges.